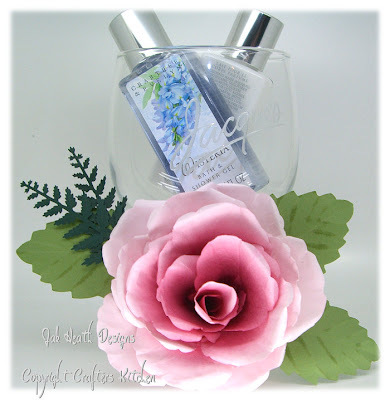 I made this Floral Punch Craft Rose from a tree punch it was a bit of a challenge as the tree punch is very very large and as it is so big the rose would be too big to go on a card but is perfect to incorporate as a gift. It took 13 tree shapes to make the rose. I punched out the shapes from pink light pink coloured paper then sponged cranberry ink onto each shape then using the shape forming tool I pressed downward whilst dragging the tool over each shape. Then I used the pointed tweezers to curl the edges of the shapes to form the petals. A close up shot of the rose. 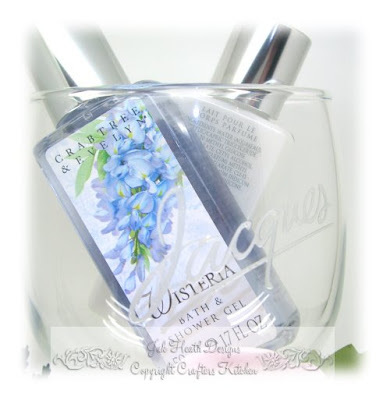 The gift is inside the glass, a shower gel and body lotion. This is absolutely gorgeous. I can't believe it is paper!! STUNNING ! STUNNING !STUNNING ! Saw you on IW, love that decoupage . WOW Jak!!! You have excelled yourself with this one. Absolutely stunning!!! Oh my word Jak....that is fantastic! So real, you could go into the florist business as well! How delightfull, your roses are so beatyfull. ABSOLUTELY STUNNING, you would never guess the Rose was made using a Punch and Paper. Wow Jak - you have excelled yourself this time. It is fab. Wish my dad was alive to see this - I know he would have loved it. I have mentioned in past to you that he used to teach paper-flower sculpture. Absolutely gorgeous who would have thought that you could make a rose out of a tree punch. 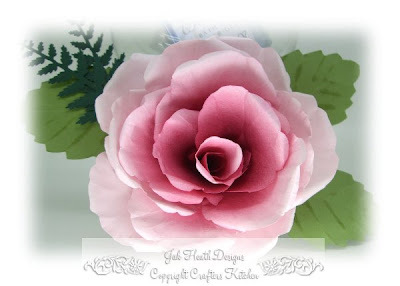 Oh Jak, that is the most wonderful paper Rose i have ever seen and to do it with a Tree punch!! Where do you get your ideas from?? You never cease to amaze me. You are one talented lady. The rose is gorgeous Jak. Super idea too!! Certainly a WOW factor Jak It is just gorgeous and so realistic. Whoever receives that will be over the moon. Wow, stunning, it looks so real. You are one talented lady. Stunning, gorgeous, wonderful!!! 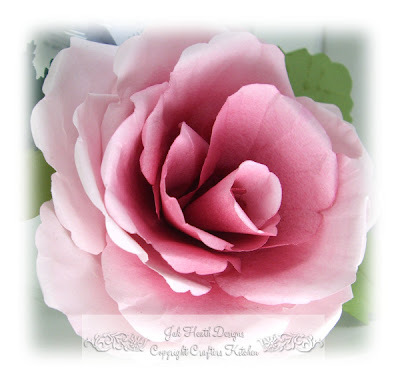 Jak I could go on and on about how beautiful your rose is, you are such a talented lady, your cards and your creations brighten my days for me. You've made me speechless again, jak. I just don't know what to say! That rose looks so real! Amazing, I thought it was real too!!! Loving that flower, it refreshes my mind releases my tensions for a while :)...Its a best gift for someone to whom you love.